If you ask any golfer out there if they would like to hit the ball straighter and longer than they currently do, the answer would almost certainly be a resounding yes. It’s the nature of this game. As golfers, we are always seeking out that extra yard and that magic item that lets us find the short grass more. As of late it could certainly be said that the biggest strides for providing golfers with these desires is through the continued evolution of the golf ball. 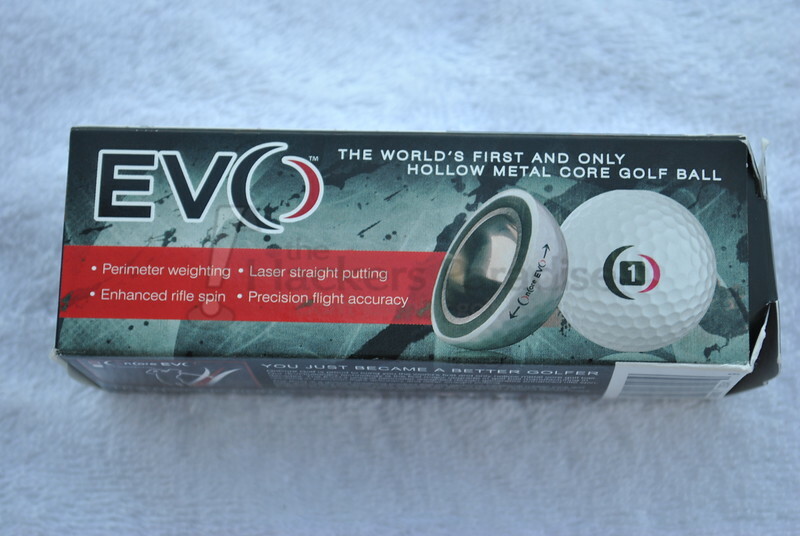 Very recently we have seen 4-piece, 5-piece, and even 6-piece golf balls enter the market, but a metal core golf ball? 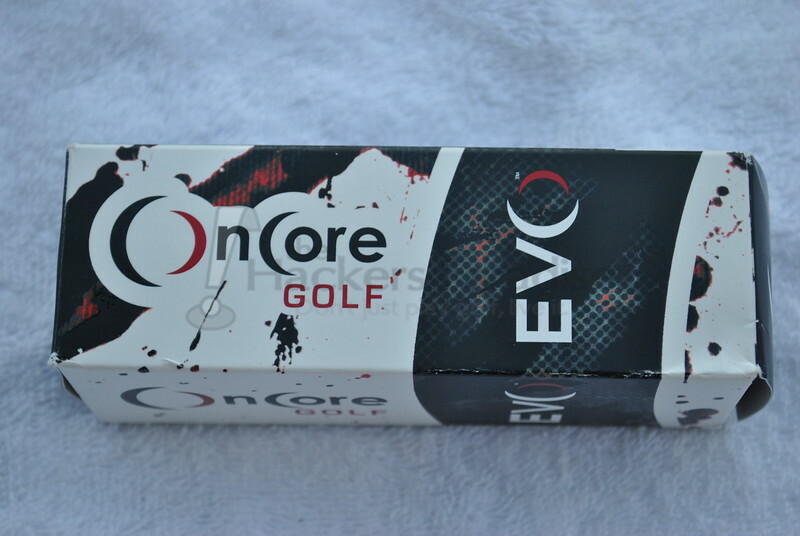 Enter OnCore golf’s new ball to the market with that very idea, the OnCore Evo. The EVO should enhance the experience and lower the score for anyone who uses it. We can’t all hit perfect fairway shots or putt like the pros but this ball narrows the gap and will have you enjoying your game more and more. The proprietary alloy used in our hollow-metal core combined with ultra-high performance polymer composite blends in the mantle layer shifts the ball’s weight to the perimeter, increasing the Moment of Inertia and reducing sidespin. The result is a straighter drive, more accurate iron shots, and laser-straight putts. Cover – Tough Ionomer cover for durable performance and 432 dimples to increase lift and distance. Instantly when I heard METAL CORE my mind went into overdrive with a mixture of disbelief and intrigue. In theory, the hollow metal core will actually shift more weight from the center of the ball and further towards the outside, increasing the MOI and dropping sidespin significantly. However, such a radical idea brings to mind a LOT more questions on performance than that of a “typical” golf ball. For the sake of review, it will be easiest to break it down by club selections in order to properly focus on the spin/flight performance throughout the bag. Naturally, with a ball that makes claims of increasing the MOI and drastically reducing sidespin, focusing first on the driver and fairway woods first just makes sense. I’ve always been able to lose a shot here either way, so the thought of lessened sidespin is definitely intriguing to me. 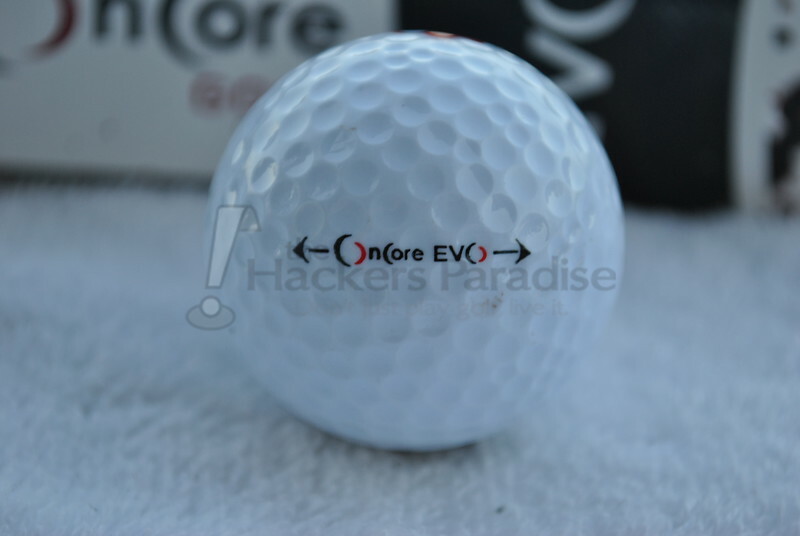 I can safely say I did see significantly less sidespin with the OnCore Evo than my current ball of choice. Even when I tried to move one hard left or right, the degree of movement was significantly less than others I tried the same shot with. Now, that isn’t to say you can’t still slice one hard – it’s just doesn’t end up moving as much as you may be used to. With the decreased sidespin I was actually seeing a slight increase in carry and a definite jump in rollout on the course. It does however bear mentioning here that these produce a much different sound off of the woods than any golf balls I’ve ever used before. Even with some of the best sounding drivers out there it produces a much louder and almost hollow metallic noise off the face. The sound will definitely take you by surprise at first, but for some, the decreased sidespin will more than make up for that. This was an interesting area for me during review. As mentioned with the woods, the Evo’s hollow metal core and perimeter weighting really does take a large bite out of the sidespin. However, while using the ball it also quickly became evident that it reduces all spin, which can produce some issues off the irons and wedges if you aren’t prepared for it. I saw very similar carry distances off the irons with the OnCore than I did with my usual ball and it seemed to want to do nothing but go straight. However, the rollout was much increased. I learned very quickly that shots you may usually get to check up simply do not do so with the Evo. I could definitely play more or less rollout with it, but I had to conscientiously change my shots to into greens in order to account for that rollout, otherwise I landed on the green and right back off again. As much as the Evo does its job in seemingly wanting to go straight off of the tee, for me it shined the most on the greens. It became very evident that there really is something there with the perimeter weighting off of the putter. Roll after roll, the Evo immediately took a nice forward roll without skidding and seemed to track to the chosen line extremely well. The consistency of the Evo here, even on the longest putts, was very good, as time and time again it possessed a tighter grouping to the hole. It was definitely very interesting to be able to see the metal core idea work with such a miniature swing/stroke. I do believe that it is worth noting that in-hand the OnCore Evo does possess a visible seam on the cover all the way around the ball. This really shouldn’t come as a huge surprise since the ball does have a metal core rather than being poured/injected core like most golf balls. The innovation in the golf industry will never cease to amaze me. 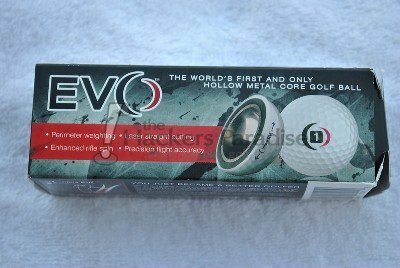 The fact that we are now seeing a golf ball with an actual hollow metal core in it is nothing short of mind blowing. Even more interesting is that the ball does what it claims as sidespin is definitely decreased with the OnCore Evo. However, the performance of the Evo will definitely necessitate adaptations to one’s game in terms of their shots with scoring irons/wedges in hand. For some, being in play more off the tee may be entirely worth the sacrifice of more rollout into greens. For others it may not be worth it at all. 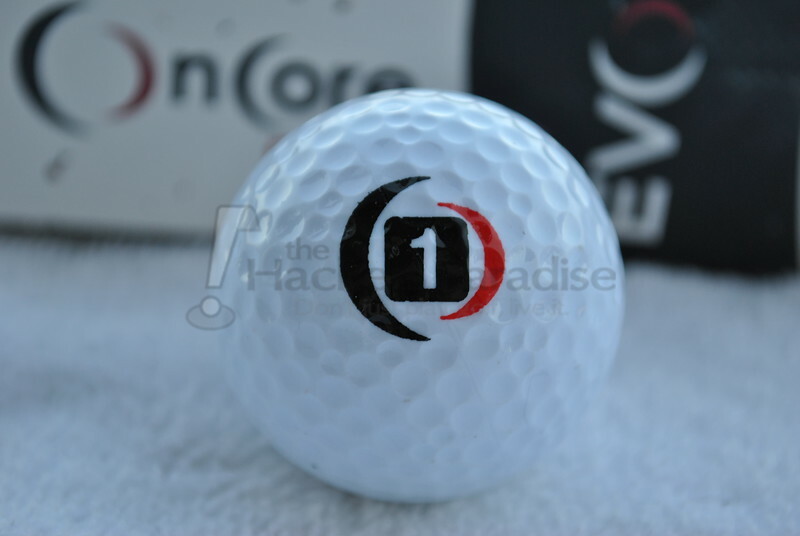 In the end OnCore has definitely brought a very innovative twist into the golf ball market. The OnCore Evo is currently available through www.OnCoregolf.com with a dozen retailing at 39.95 and a single sleeve available for 9.99. The 2013 Players Championship – Storylines? Some good feedback there James. It’s good that companies push the technology edge to create a better product. Reduced side spin is a good quality but lack of spin into the greens would concern me. Interesting ball here James. These are definitely intriguing and I could see this ball benefiting quite a few golfers. Less side spin from the tee means getting the ball in play for many. The iron /wedge rollout may not be a serious issue for some golfers. These could be a serious contender for going into a few bags. Good feeedback Jman. Spin into greens means nothing from the trees! Great review, James. This is certainly an intriguing ball, and lots of golfers would love to see the lessened sidespin off of the driver and woods. For me, the less spin on iron and wedge shots would take some getting used to, though. I’m not 100% sure what I think about these. I think they certainly have a good niche that seems to be effective. Lots of people could benefit from some reduced side spin. At the same time, I see the lack of back spin and price as a negative. Not sure I’d be all that interested, but I know there are many that will be. Nice work on this James. Solid review here James, performance sounds pretty darn similar to the Polara in my experience. A good offering for the golfer that needs help keeping the ball flying straight and that is not wanting to see a hop & stop around the greens. Great review, James. Sounds like a good ball for giving golfers a fighting chance of staying in the fairway. Straighter off the putter is very intriguing. Thanks for testing these James. 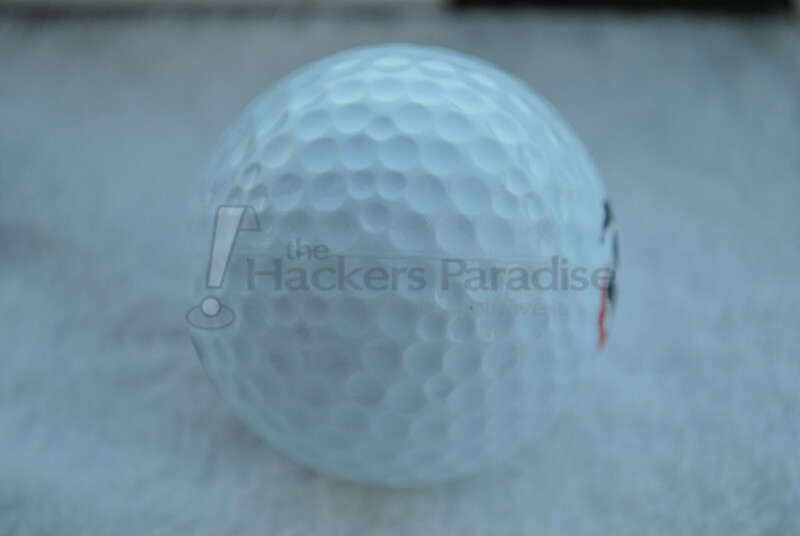 I’m sure these is a market for these balls somewhere and am curious who will end up playing them in their rounds. Love seeing the technology of golf continue to push the limits. Great write up JMan! Did the reduction in spin on the irons cause you to club down and aim for the front of the green, or was the difference not that severe? Great write up, very interesting stuff for sure. It makes me want to try a sleeve myself to see what they’re like! In your experience would you say they’re straighter than the e6? Thanks for the review Jman. I don’t know about these, it just seems pretty gimmicky to me and for $40 a dozen I would probably stick with my current gamer or if I was really battling a slice and needed it to go straight I’d get a Bridgestone e6 and save some $ and probably be better off all around. I would be interested in trying on though, I bet that sound you talk about is interesting to say the least. Thanks buddy! Great review JMan. Very interesting tech in those balls. Not sure they’d be a good fit for my game, but it definitely would be interesting to try them out sometime. Appreciate the thoroughness of your testing! More than I would spend on balls, but I do like the reduced sidespin and the roll on the greens. The lack of backspin would concern me as a low handicap player. But I can definitely see the advantages for the higher handicap player with the reduced sidespin. absolutely fascinating. Would love to hear the difference you speak of. I don’t see how this can help with putts. The majority of missed putts by amateurs are due to deceleration and miss-reads. They are still going to miss putts. Got my OnCore dozen delivered yesterday for $44.95. I didn’t play the first couple of holes with one; instead, I opted to start the round off trying out the NXT Tour S. The NXT Tour S is LONG.. but after a double bogey on the par 5 #5, I pulled out an OnCore ball and teed ‘er up. I blasted that baby straight down the middle about 280. I couldn’t believe it.. and these are legal? WOW. One thing I will say, is they are LOUD off my Titleist 913 D2 driver face; almost sounds like a Nike Square Sasquatch driver – remember those aluminum bat sounding drivers? Anyway, I tee’d another up on #9 into the wind and killed that one too but it got up high and sliced a little and I wound up having to punch back out from some trees. Overall, I hit these pretty good all day long. They do give you a lot of roll so down aim toward rough if you can run through the fairway on a dogleg. They came off a little higher from my SM5 Vokey wedges too. They putt smooth; nice feel off my Cameron Newport putter face. I putted lights-out with them when I used them; typically I am pretty good at getting them close from 20’ and out. Worth the price… HELL YEAH! 🙂 Just need to adjust to the amount of rollout they give you. Great review. I just bought some this morning and tried them out around the green. 1. I was surprised at the performance around the green because I was expecting this to be the weak point of this ball. The reduce in check for me was almost imperceptible, but something that wasn’t discussed is that you have to get used to the feel around the green which can be difficult if you have been playing with rubber core balls for decades. 2. This was more than compensated by the increased MOI of the ball because it was evident that even around the green the ball is easier to hit consistently straight on a path!! I will follow up after I play a round with them and have a chance to hit some woods and irons. I am concerned about the Irons because I would think less spin would also mean less height and different ball flight.